Conventional chemotherapeutics lack the specificity and controllability, thus may poison healthy cells while attempting to kill cancerous ones. 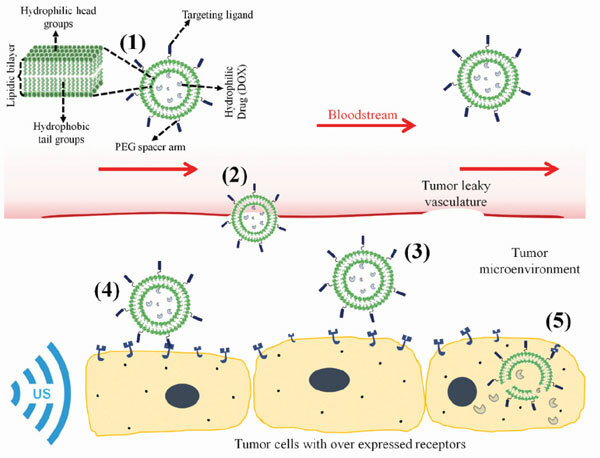 Newly developed nano-drug delivery systems have shown promise in delivering anti-tumor agents with enhanced stability, durability and overall performance; especially when used along with targeting and triggering techniques. This work traces back the history of chemotherapy, addressing the main challenges that have encouraged the medical researchers to seek a sanctuary in nanotechnological-based drug delivery systems that are grafted with appropriate targeting techniques and drug release mechanisms. A special focus will be directed to acoustically triggered liposomes encapsulating doxorubicin. Chemotherapy, multi-drug resistance, anthracyclines, doxorubicin, nano-carriers, ultrasound.